Summary: Six months after September 11th, New Yorkers are instructed to get on with their lives despite the terror advisories, streets filled with 9/11 merchandise, and mail that may contain Anthrax. But for Hailey, still jobless after college and living in her family's Fifth Avenue penthouse, getting on with life means getting closer to Michael Brenner, the Princeton graduate and future human rights lawyer who seems to have it all. The city feels as if it's on the brink of apocalypse, and seeking out any sort of future seems pointless. So Hailey and her friends - Katie, already working at Morgan Stanley; Randy, a trust-fund kid who wears sweaters with holes in them; and Jess, confident of her future success regardless of her present inertia - stay out all night, dream up get rich quick schemes and aspire to greatness while questioning how much that greatness really matters. Like many Americans, I was devastated by what occurred on September 11, 2001. Our family had just moved from the Washington, D.C. area a week and half before these events, and I felt as if we had sort of dodged a bullet. I passed the Pentagon every day on my way to the office and I couldn't get over that something this horrible had happened so close to where I spent most of my waking hours. I was grateful that I was now "safe" in Central PA, but I knew things would never be the same for our country. Even though many years have passed since that tragic day, I can still remember my emotions when I discovered that America was under attack. Maybe it's my way of never forgetting, but I've found that I am drawn to books that delve into the subject of 9-11. So when I learned about a new book called THESE DAYS ARE OURS by Michelle Haimoff, I knew that I wanted to read it. Of course, it didn't hurt that the book had received Starred Reviews from Publishers Weekly and Booklist; and the blurbs by well-known authors (like Jonathan Tropper) were pretty impressive. THESE DAYS ARE OURS takes place just six months after September 11th in New York City; and it tells the story of Hailey, a recent college grad who is trying to get a job and basically figure out what direction she wants her life to go. It's a tough time for Hailey -- her life is full of fear and change, and Hailey isn't so sure it's worth the effort to try that hard at being successful. She spends more time thinking about Michael, a Princeton grad who seems to be "perfect" than trying to find a job. (Of course, she can do that since she lives is her family's Fifth Avenue penthouse.) When she meets Adrian, a sweet guy who doesn't really fit in with Hailey and her friends because he isn't "elite," Hailey is forced to reevaluate her perspective on her life. Along the way, she learns that there is much more to her and her aspirations that she first realized. One of the initial reasons I wanted to read THESE DAYS ARE OURS was because it was supposed to offer an insider's view into New York City after the 9-11 attacks. I realize that I wasn't directly affected by these terror strikes and I know how much it changed me, so I can only begin to wonder what it was like for the citizens of New York. I can definitely say that Ms. Haimoff captured the essence (and darkness) of what it must have been like, and I appreciated how honest she was in showing the desperation of the people... especially the younger ones who were really just beginning their grown-up lives. In so many ways, THESE DAYS ARE OURS is a coming-of-age story, and I do love a good coming-of-age book. While Hailey's character is extremely different from me (both now and when I was in my early 20s), I did enjoy her story. I found the ways her character evolved to be interesting, and I did get caught up in the drama of her life. That's not to say that I always liked her or agreed with her actions though. At times, I found her to be spoiled, selfish, and immature; however, I kept reminding myself that she had a privileged upbringing and that she was very young.. and she was ultimately growing up and becoming more aware of what's important in life. 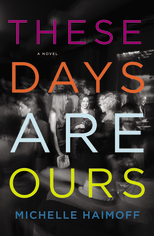 THESE DAYS ARE OURS is one of those books where you don't have to relate to the characters to appreciate the story; and that hasn't always been the case with me recently with novels. I think that's a testament to the author's writing style. Ms. Haimoff is a very talented writer and she did a very good job of evoking a lot of emotions in my while reading this story. I felt the devastating pain of the 9-11 aftermath as well as the insecurities that Hailey was feeling about her future; however, I also liked that the story was smart and funny and very entertaining. I believe Ms. Haimoff managed to effectively capture the essence of a young generation that was trying to find their way after a life-altering tragedy. Overall, I do think THESE DAYS ARE OURS would make an interesting book club pick. I'm not sure it would work as well for my club since we are all middle-aged women in Central PA, but I do think it would be excellent for a younger group. Unfortunately, I wasn't able to find formal discussion questions although I'm not sure that they are necessary to generate discussion. Some of the themes you might want to talk about include loss, grief, change, friendships, parent/child relationships, love, forgiveness, change, maturity, expectations, and discovering one's self. I found THESE DAYS ARE OURS to be a well written novel with some very interesting character development. Highly recommended. Hey, I am way down here in Florida and I know that 9/11 completely leveled me. I find myself gravitating towards all the 9/11 books too, both fictional and non-fiction. I'm a little unsure of this one, only because it sounds like the characters are self-absorbed. I suppose that is reality though, isn't it? I was shook to the core after 9/11...scared to death that the end was near. Even in rural Minnesota, the fear was palpable. I fall to the other side with my book choices though. I tend to steer clear of 9/11 books and movies. I feel like there's been so much in the press about it that there can't be anything left to add. But this book sounds unique because it is not told from the viewpoint of a direct victim or victim's family. It might be worth a try. I think 9/11 changed all Americans and I can't imagine what it was like for those living in New York. I can see where it would especially change young people who are still trying to find their way. This book sounds great! I think the 9-11 attacks changed everyone...I remember exactly where I was when the towers were hit and I know exactly how frightened I was living so close to the Pentagon, etc. I haven't read very many books about 9/11 -- maybe because it still seems so vivid in my mind despite the fact that I too was safe in central PA. This one, though, sounds like gateway into the topic. Like Sandy, I find myself gravitating toward 9/11 books. I'm surprised I haven't heard of this one so thank you for bringing it to my attention! At one point I was grabbing up every 9/11 book and reading it, so I think it's a pretty good conjecture that I would like this one also! Canada felt the effects of 9/11 too as neighbours of America. I have friends in NY who told me their stories of that time. This book sounds good.